Usage of banana is plenty, from the fruits, leaves and stalks, none is wasted. Usage of banana is extensive. Banana has to be one of the most popular tropical fruits worldwide. However, do you know that there are so many types of banana plant that some do not even produce any fruits? The types of banana that make their way into your supermarket most likely came from Central America.They are large bananas, which ripen along the way in the cargo hold en-route to the destinations. In Malaysia, we have many types of bananas too. Some are big (like pisang nangka), some are small but sweet (like pisang emas). Others can only be good when there are cooked in curry or made into snacks (kerepek pisang or pisang salai). Big fresh banana for export is known as "pisang montel", this is developed by the Ministry of Agriculture to introduce Malaysian fruits to the world. Favorite way to cook banana? Goreng pisang has to be it! It is simply sliced bananas dipped in crispy batter and deep fried. We even have a saying in Malay: "Laris seperti goreng pisang panas" Meaning: something is so desirable that it is sold out quickly like hot banana fritters. The Malay saying also says: "Pisang takkan berbuah dua kali" It is an observation that the banana plant will only bear fruit once. After the fruits are taken away, you have to grow a new plant to get other fruits. The saying means, something that will not be allowed to happen again or s omething which is impossible. There are literally hundreds of ways to include this fruit in Malaysian food. Even the flower of the banana (also known as the heart - jantung pisang) is boiled and served as ulam with sambal belacan. In fact, the whole plant is useful. The soft stalk is invariably used as a base of a flower arrangement in weddings. In Malay wedding, the stalk is used to stick betel leaves in an arrangement called "sirih junjung". Indian weddings use the whole plant with fruits and flowers as a decoration in their ceremony. This symbolizes good wishes to the happy couple so that their marriage is as fruitful as the banana plant. Even in the legend of the story of "Singapore Attacked by Swordfish", the humble banana plant saved the day. Hang Nadim, the clever boy, suggested that the Singaporean people built a small fortress made of banana stalk instead of using their own calves to prevent the onslaught of the fish which flew over their beach killing the citizen. The "brilliant" idea of using the calves came from the Sultan himself. In the end people who were jealous of Hang Nadim backstabbed him and he was sentenced to death by drowning by the good Sultan. Hmm..go figure. However, as legends go, I hope this is not a true story. But, on the other hand, at the supposedly spot right where he was drowned called Teluk Belanga, people, especially fishermen, sometimes heard an anguished cry of a boy and even tinkling of metal chains. Scary, eh? However, it is only one more usage of banana mentioned in literature! Another usage of banana is, the leaves are used extensively also, mainly for wrapping food. Nasi lemak or nasi dagang is supposed to be tastier if they are sold wrapped in daun pisang (banana leaf). In some Indian restaurants, the leaves are used to serve food instead of plates. Same argument also and saves a lot of washing up! There is even the correct way of folding the leaves after finishing the meals. If you are happy with the food, you fold the leaves towards you. Otherwise, you fold the leaves away from you (well, it is not advisable to do so in order not to offense your host!). 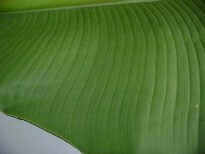 The leaves are used to wrap "kuih lopes", pulut udang, tapai and many other traditional Malay food. It is also used like an aluminum foil to layer food for barbecue. Below, I show you how to prepare the leaves for wrapping food. Wait, don't throw away the spine of the leaves just yet. Kids love playing with it :-)I teach my children to use it as a stencil to make cute patterns on their drawing blocks. Cut it diagonally and you have a nice pattern from nature. Another good usage of banana.